Manhattan Prep Complete Verbal Set, 4th Edition: These publishers offer separate books on every Section of the GRE Verbal such as Reading Comprehension and Sentence Completion. Each book concentrates on one particular section, so more the elaboration along with more practice question leads to a better understanding. Additionally, these books tend to have questions which are tougher than normal, if you score high in the practice tests present, you will score better in the real. GRUBER'S COMPLETE GRE GUIDE: The most obvious way to start your journey into the GRE Preparation world is through this book. It is highly recommended for people who are starting from scratch and are considering self-preparation. This book outlines the GRE Test format and serves as an essential introduction to the Verbal Section and the types of questions asked in each of its sub-sections. It supplies the Baby GRE words and is the best way to begin the preparation. NORMAN LEWIS WORD POWER MADE EASY: The next step involves targeting and perfecting your Vocabulary, and this is just the book for that task. This book is based on the etymology of the words. Every word comes from a parent word and having this etymological knowledge will help you make intelligent guesses regarding words that appear unfamiliar in the test. It is a shortcut to perfecting your Vocabulary and once the etymology is understood it will be easier to learn new words. BARRON'S VERBAL WORKBOOK: Has 350 questions on verbal sections with answers. Includes two verbal reasoning practice tests. BARRON'S ESSENTIAL WORDS FOR THE GRE: This book can also be used along with the Barron's to prepare for the Test. 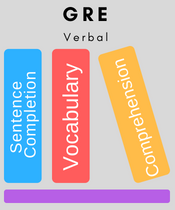 It concentrates on the questions and words that are frequently observed in the GRE Verbal Section. It is more recommended for people who have to crack the GRE within a short span of time. KAPLAN'S GRE VERBAL WORKBOOK: If Practice makes a man perfect this book is the key to it. When it comes to practice, this book provides the more difficult questions and a large number of test questions in each section. Six practice tests are included. Tips for analytical section are also included. NOVA'S GRE AND McGRAW HILL'S NEW GRE: These books are useful only because of the practice tests they provide. Verbal Workout for the GRE - Princeton Review: It has more than 250 questions on verbal section with detailed answers. There are many online websites and forums which offer a variety of practice questions and also publish the recent questions that appeared in the Test. Hard work, Practice, and Preparation with the right material will help you score a 155+ in the GRE Verbal Section.